On Sunday, I went to Maker Faire in San Mateo, California, one of the most mind blowingly inspiring events I've ever been to. Described as "the people's World's Fair", Maker Faire celebrates DIY culture of all kinds, uniting amateur crafters, hackers, growers, engineers, poets and chemists. The philosophy of the event is that everyone is a maker. Part of the purpose of my blog is to encourage other people to make their own clothes, to feel the same pleasure, satisfaction and connection to the world that I've felt since I started sewing 17 months ago. So it was so exciting to be at such a large-scale event which recognises the creative potential in everyone. From skittles-powered robots to embroidery demonstrations, gardening to soldering workshops, upcycling to cheese-making, the day spread such joy to everyone who was there, who played and made stuff. 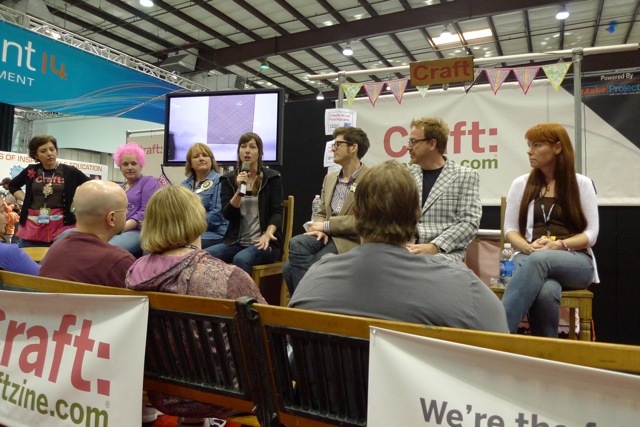 I happened upon the Craft Stage just as a panel discussion was beginning called 'Crafting Your Online Presence'. The session focused on how to turn a craft blog into a successful business, with insights from panellists Jenny Hart from Sublime Stitching, Drew Emborsky from The Crochet Dude, Moxie from Made by Moxie, Garth Johnson from Extreme Craft, Cathe Holden from Just Something I Made, Alice Merlino from futuregirl, moderated by Craftzine's editor Diane Gilleland. 1) Be authentic. Do and write about what you're excited about, not what you think people want. It may not be for everyone, and that's fine. If you really care about what you're doing, you'll find your people. 2) Be passionate, be reckless, but be organised. 3) It may take years before you get widespread exposure or generate revenue, but keep in mind that you're building up your brand during this time. 4) The more you give, the more you get. 5) Blog stats and numbers of followers don't mean anything. What matters are the people who really like what you're doing and interact with you. 6) If you want or need to make money from your online presence, people understand that. They know that by paying for your product or service, they're helping you to grow your business, not fund a decadent lifestyle. 7) Don't accept every opportunity that comes knocking, or you'll be too busy to do the stuff you really care about. 8) You don't need an MBA to solve business problems. As a creative you can solve problems creatively. 9) If you're serious about building up reader numbers, consider paying for adverts. The Crochet Dude takes out adverts during snow storms when he knows people have time on their hands to browse websites. 10) Don't waste too much energy protecting your intellectual property. Let it go, give stuff away, and stay creative. What was interesting was the range of opinions and approaches, not all compatible, demonstrating that there are no set rules. In fact, while I was nodding along for much of the session, I didn't agree with absolutely everything that everyone said, and that's okay. What about you? Do you strongly agree or disagree with any of the points above? Do you have your own thoughts on how to make a craft blog or online business successful? And finally, my favourite thing at Maker Faire - motorised muffin mobiles!